In a time before smartphones and Siri, ordering in consisted of opening up a paper menu, picking up your landline and calling Pizza Pizza, a Chinese place or Swiss Chalet. Then, with your stomach growling, you’d wait about an hour. If you wanted take out from a restaurant, there were delivery options, but they were pricey and took even longer. Now with the swipe of your finger a hot meal can be at your doorstep within minutes. You can pick up your lunch without waiting in a line or even having to pull out your wallet. These new food apps are changing the way we eat today. Taxi drivers can’t compete with this. First launched in Toronto within the Uber app last spring, the service became so popular the company recently created a standalone Uber Eats app. Partnering with over a hundred top restaurants across town (mostly in the downtown core) you can order lunch or dinner with delivery times between 30-45 minutes. On weekdays between 11am - 2pm there’s the option for ‘instant delivery’ where roaming Uber drivers have 3-5 different dishes already in their vehicles available to you within minutes. And with options like Grand Electric, Queen Margarita Pizza, Playa Cabana and so many more, be prepared to be overwhelmed and darn right indecisive. Launched in Toronto last year Ritual is all about saving you time and simplifying your lunch or coffee run. The app has partnered with over 250 downtown businesses so you’re guaranteed to find something you like. Once you’ve clicked on the restaurant or coffee shop you’re feeling and chosen the meal or beverage you want, a countdown appears along the top of your phone telling you when your order will be ready. Then all you have to do is find the Ritual sign on the counter and pick up your order. The app charges your credit card and the best part - you skip the line. You can also view recent orders making it quick and easy to get your favourite thing again and again. After its success in Toronto, the company is now expanding to the U.S. This lunchtime delivery app is all about local, fresh and sustainable food. The fine people behind Feast pride themselves on the healthy meals they make and their creative and delicious menus. A few examples of their always changing dishes include a flank steak cobb salad, harissa spiced tomato chickpea soup and a naturally raised chicken sandwich. Feast is available in downtown Toronto between 11am - 1:30pm with delivery promised within 20 minutes. Dinner service is said to be coming soon. Too hungover to get off your couch to go to McDonalds? Don’t worry because for $6 (plus 5% processing fee) Favour will deliver you that Big Mac you need so badly. They also deliver from Chipotle, Tim Hortons, Subway, Starbucks and Banh Mi Boys and many other non-fast food chains (but equally desirable) like Salad King, House on Parliament, Fresh and Pai. But the game changer here is the ‘Order Anything’ button. Type in the store or restaurant name, the item/dish you want and you’ll have it at your door within 35 minutes (average delivery time). You also pay over the app, making things that much easier. 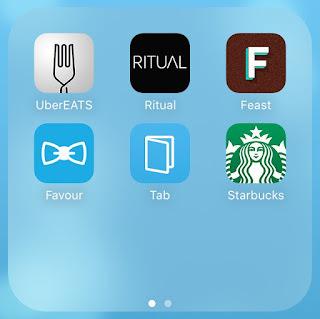 When it comes to dining out, Tab is really all you need. You can find restaurants near you, make reservations, easily split the bill with friends and settle up, all over the app. There’s no waiting around at the end of the meal for a bill and credit/debit machine. Tab has partnered with a number of popular restaurants in Toronto including Terroni, Campagnolo, Byblos and Portland Variety. The app is also available in Montreal. If you’re a Starbucks lover then you’ll agree this app is the best thing that’s happened to the company since the creation of the red holiday cups (well that's up for debate!). There’s no fumbling around for change, just flash the barista your barcode and you’re good to go. Recently they’ve taken the app to the next level. You can now order ahead, skip the line and pick up your drink directly at the bar. And don’t forget, for every 12 drinks you purchase over the app, you get 1 free.